Start your Iceland adventure with a short Reykjavík city tour and see highlights of Iceland’s capital. 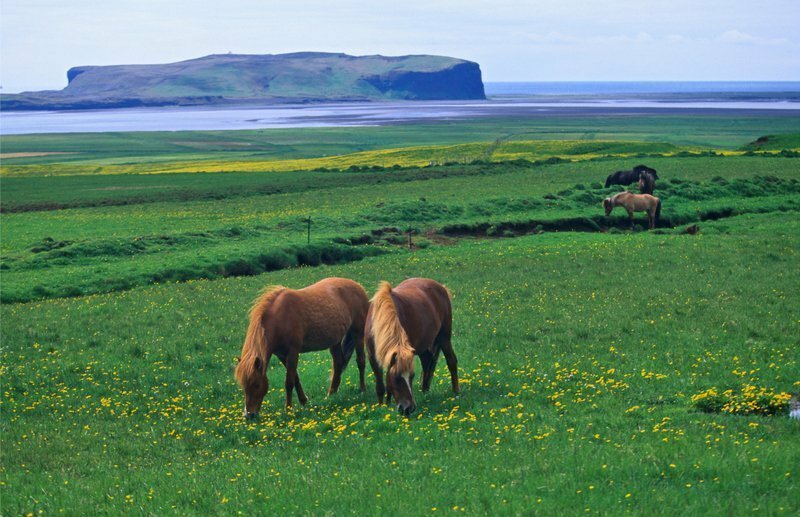 We head east and visit an Icelandic horse stable and a geothermal greenhouse. 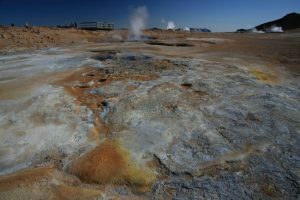 We continue to the Geysir geothermal fields with a variety of hot springs and bubbling pools. The original geyser is now dormant but has been replaced by Strokkur “the Churn”, which erupts at 5-10 minute intervals. Nearby is Gullfoss “the golden falls”, a double waterfall that tumbles 34 meters into the Hvítá river, and attracts tourists and travellers in summer and winter. 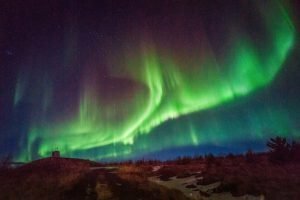 We travel inland to Þingvellir National Park, a UNESCO World Heritage Site. We continue over the highland track “Kaldidalur” along Langjökull glacier north to the Saga valley of Borgarfjörður where we spend two nights in Reykholt, West Iceland. The Snæfellsnes Peninsula “the peninsula of the snowy mountain” juts out from Iceland’s west coast, like a long arm with a clenched fist at its tip, and is in many ways a microcosm of the whole island. A rugged mountain chain runs its length. 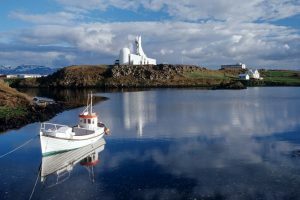 We travel to the charming fishing town of Stykkishólmur for a bird watching and nature tour where we cruise between uncountable islands in the Breiðafjörður fjord. Afterwards, we get to stroll around the sheltered harbour which provides a good place for fishing vessels to anchor, and we get to explore this charming town with its many old wooden houses. A uniquely Icelandic “treat” awaits us at Bjarnarhöfn where they make fermented shark. As we head back to Reykholt we travel through lava fields and along the ocean. On the way, we stop in Borgarnes where we have the opportunity for an optional visit to the Icelandic Settlement Center museum, or to the local geothermal swimming pool. 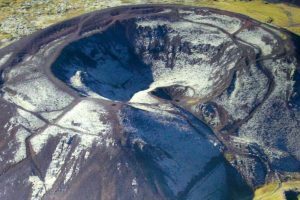 The Borgarfjörður valley is known as the Saga valley of West Iceland because many important historical events took place there. Hraunfossar is a series of waterfalls pouring from beneath a wide lava field. 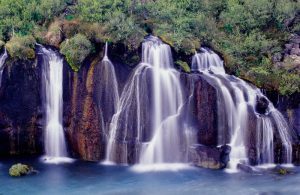 Barnafoss – the Children’s falls, is nearby and has its own tragic tale. We get warmed at Deildartunguhver, Europe’s most powerful hot spring which produces 180 litres per second of water that is nearly boiling — 97° Celsius. 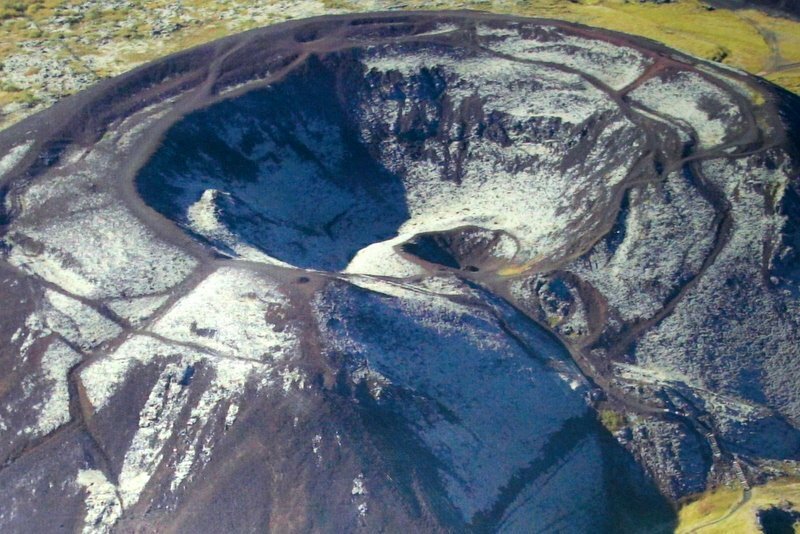 We get a chance to climb the Grábrók volcano crater. 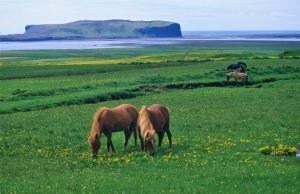 In the afternoon we have a long drive from West Iceland to Lake Mývatn in Northeast Iceland, travelling through the fertile farmlands, along fjords and over high mountain roads. We stay two nights at Lake Mývatn, an ideal location to search for the Northern Lights from September to April. 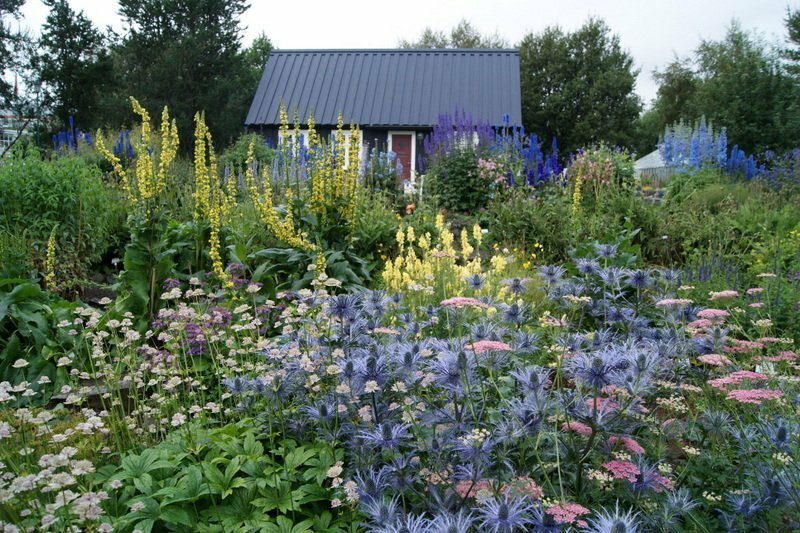 We tour the Lake Mývatn area, considered as one of the most fertile areas in the world so close to the Arctic Circle. The lake’s unique features are shaped by nature – strange lava formations, pseudocraters and attractive bays filled with thousands of birds. 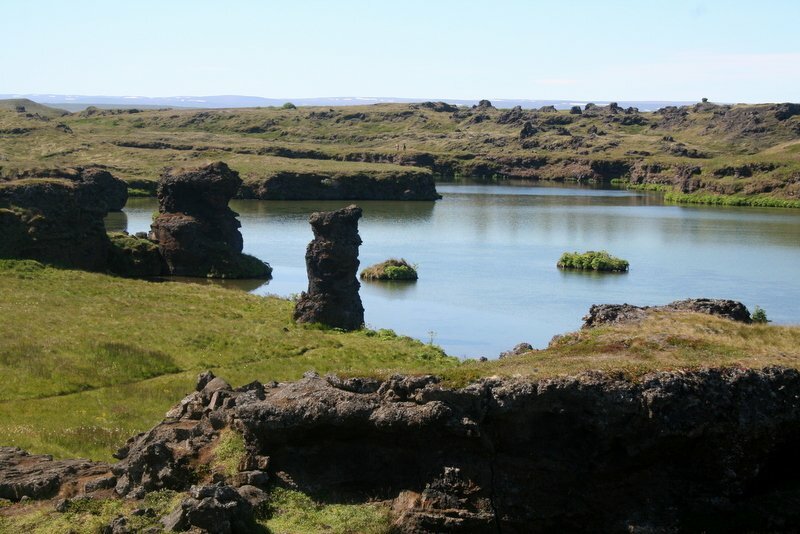 We stroll through the lava field of Dimmuborgir and we walk to the rim of the ash crater Hverfjall. As a reward for all that walking, we take a relaxing soak after dinner at Lake Mývatn Nature Baths that contains a unique blend of minerals, silicates and geothermal micro-organisms and whose warm soothing waters benefit both skin and spirit alike. We start the day with a visit to the Lake Mývatn bird museum, where the owner, Mr Sigurgeir has a passionate interest in Icelandic birds. His museum has over 80 species, all in a well-organized exhibit which is interesting to people of all age. 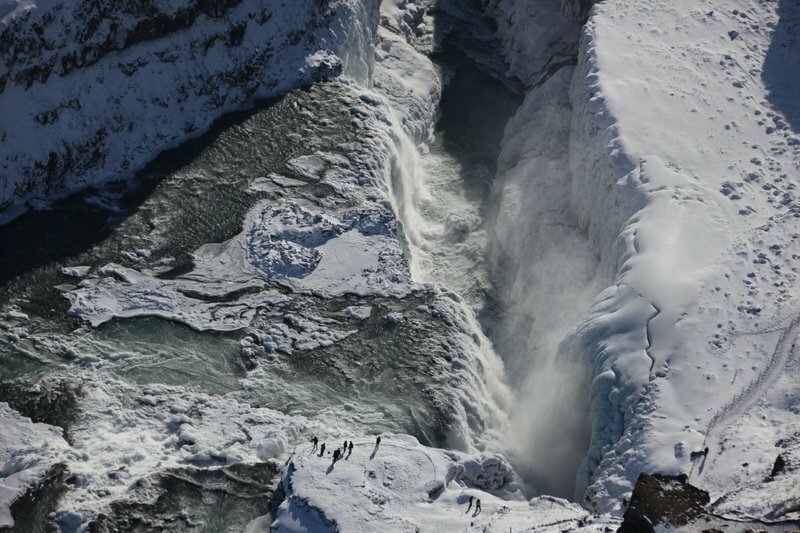 We travel to Goðafoss, the waterfalls of the Gods, an important spot in Iceland’s history. Next stop is the Christmas Garden, a small museum and shop with countless items connected to Icelandic Christmas traditions. The afternoon is free at leisure to explore Akureyri, the capital of North Iceland. There are excellent local museums, a beautiful botanical garden and a great geothermal swimming pool. Evening flight to Akureyri to Reykjavik. Overnight in Iceland’s capital.